Comic News Insider: Episode 444 is now available for free download! Click on the link or get it through iTunes! Sponsored by Dynamic Forces. Due to the hurricane, the podcast is late and Jimmy's co-host had no transportation to come do the show. Alas, Sandy can't stop CNI! News includes: Disney buys Lucasfilm, Matthew Vaughn out/Bryan Singer in for X-Men sequel, G4TV cancels Attack of the Show and X-Play, Li'l Gotham comes to DC Digital, and Monkeybrain Comics to donate all November proceeds. As always, listener feedback, Top 3 and more! Leave your iTunes comments! 5 stars and nothing but love! Jimmy had several drinks late night at a bar and convinced Michael Avon Oeming, Taki Soma and Emma Vieceli that it would be a good idea to do some podcasting at said bar. We chat mostly abot Oeming's career with Taki and Emma commenting in at their leisure. Super fun, informative, and at times silly...but mostly SUPER FUN! Leave your iTunes comments! 5 stars and nothing but love! Jimmy flies solo again to bring you some more great interviews from New York Comic Con with Blair Butler (G4TV), Seth Kushner (Culture POP Photocomix) and Tera Patrick (Sinner Takes All). News includes: CW's Arrow gets full season pick up, Warner Bros beats The Shusters, Penguin launches kids line, and Heidi MacDonald's The Beat named one of 2012's best blogs. As always, listener feedback, Top 3 and more! Leave your iTunes comments! 5 stars and nothing but love! Comic News Insider: Episode 441 is now available for free download! Click on the link or get it through iTunes! Sponsored by Dynamic Forces. Jimmy flies solo again to bring you more special interviews from New York Comic Con. He attended the roundtables for the remakes of Evil Dead and Carrie where he chatted with Bruce Campbell, Julianne Moore and Chloe Grace Moretz! Bruce was hilarious and Chloe was so smart. Jimmy almost lost his senses chatting with the stunning Julianne though. Hear some great tidbits on the upcoming movies! Leave your iTunes comments! 5 stars and nothing but love! Comic News Insider: Episode 440 is now available for free download! Click on the link or get it through iTunes! Sponsored by Dynamic Forces. Jimmy flies solo to bring you even more interviews from New York Comic Con! Here he chats to Neil Dvorak (Easy Pieces), Caleb Monroe (Steed and Mrs. Peel), Josh O'Neil and Andrew Carl (Once Upon A Time Machine), JT Petty (Bloody Chester), David Phillips and Sarah Braly (Hi-Fructose Zombies) and Peter Tomassi (Red Bubble). Leave your iTunes comments! 5 stars and nothing but love! Come back on Saturday for a NYCC movie special featuring roundtable interviews with Bruce Campbell (Evil Dead), Julianne Moore (Carrie) and Chloe Grace Moretz (Carrie). Come back on Thursday for a NYCC interview special with Caleb Monroe (Steed and Mrs. Peel), David Phillips/Sarah Braly (Hi-Fructose Zombies), JT Petty (Bloody Chester), Josh O'Neil/Andrew Carl (Once Upon A Time Machine), Neil Dvorak (Easy Pieces), Peter Tomassi (Red Bubble Chief Community Officer). And then again on Saturday for a NYCC movie special featuring roundtable interviews with Bruce Campbell (Evil Dead), Julianne Moore (Carrie) and Chloe Grace Moretz (Carrie). Now go check out these great companies and people! Please forgive if I've forgotten someone and do let me know. Still recovering from it all! Thanks! 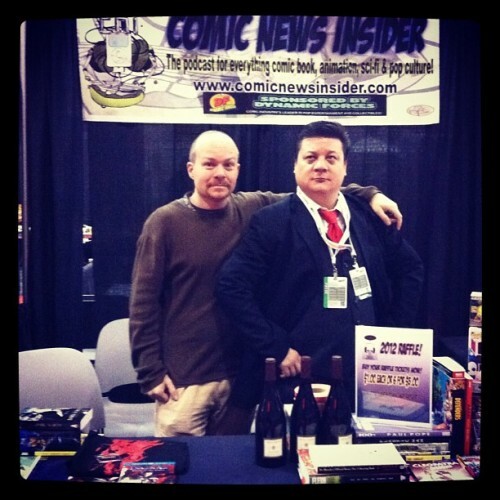 Comic News Insider at New York Comic Con! Booth #3350! Here's the schedule for what's happening with COMIC NEWS INSIDER at New York Comic Con this week! Signings, raffle and interviews galore! Schedule is subject to change and I expect it to happen on occasion. But do swing by and say hi! Come on by to get your tickets for the raffle! $1 a ticket or 6 for $5. Lots of great swag to give away including signed comics from Garth Ennis, Greg Pak, Fred Van Lente, Paul Pope and more. Prints from Paul Pope, Ming Doyle and others. Disney toys, Spawn toys and more! Many great comics from 2000AD, DC, First Second, Dark Horse, and other amazing publishers. Best thing about the raffle is that if you don't win, your ticket stays in all weekend so you have multiple chances! You'll notice on Saturday that we have 2 signings at once. There was a mixup with table placement in the Podcast Arena. The shared table was supposed to be next to the CNI table but it is now #3356. We are having signings and what not there as well. If listed here, they'll still be CNI signings! And many interviews will happen when I walk around and meet up with people as well. See you all there! 9:30-11:00am: Interviews & Breakfast: (STARZ will present a first look at David S. Goyer’s highly anticipated adventure drama, “Da Vinci’s Demons,” as part of New York Comic-Con. Goyer will be joined by series star Tom Riley, who plays Leonardo Da Vinci, and costars Laura Haddock and Lara Pulver. 1:15pm – 2:00pm: EVIL DEAD roundtables with Jane Levy, Bruce Campbell (Producer) & Fede Alvarez (Director). 2:35pm-3:30pm: CARRIE roundtables with Chloe Grace Moretz, Julianne Moore, Kevin Misher (Producer) & Kimberly Peirce (Director). 4pm: Peter Tomassi. Chief Community Officer and Evangelist for Red Bubble. 5-6pm: LOST GIRL. Ksenia Solo (Kenzi), Zoie Palmer (Lauren), and Rick Howland (Trick). 12:10-1:15pm: 666 Park Avenue. Cast: Terry O’Quinn, Vanessa Williams, Rachael Taylor, Dave Annable, Robert Buckley, Mercedes Masohn, Helena Mattsson, Erik Palladino, Samantha Logan. Producers: David Wilcox, Matt Miller. 3:00pm: Blair Herter, Jessica Chobot (G4TV). Episode 438 - Pre-New York Comic Con Madness! Comic News Insider: Episode 438 is now available for free download! Click on the link or get it through iTunes! Sponsored by Dynamic Forces. Producer Joe sits in to co-host this pre-NYCC special! We chat about what events will be happening at the CNI booth (interviews, signings, raffle, etc) and in general at the convention. Come to booth #3350 and see us! Events will be posted soon. News includes: James O'Barr returns to The Crow, Frank Cho makes Wolverine savage, Garth Ennis brings crime to Dynamite, Dear Dracula gets animated as do Iron Man and The Hulk. As always, listener feedback, Top 3 and more! Leave your iTunes comments! 5 stars and nothing but love! New York Comic Con is this week from October 11th-14th! Comic News Insider will have their booth again in the Podcast Arena! Come by and visit #3350 for signings, interviews and our annual fundraising raffle where you can win great swag! Signed comics, toys and more! The schedule of events at the CNI table will go up next week! Producer Joe will be there as well taking donations for The Project Solution and giving away messenger bags with original Paul Pope art (also signed/numbered) as a thank you gift for donation $30 cash or $32 credit. We'll also have some official CNI photographers roaming around taking pictures so look for a massive photo album coming the following week. SO MUCH GOING ON! Back in the rotating guest co-host chair this week is Gretchen Souerwine! It's been awhile but she comes well prepared and researched plus brings her professional news reader voice. Also joining Jimmy, is artist David Reuss. He discusses his work, being on the board of the Society of Illustrators, their recent acquisition of MoCCA and more! Gretchen and Jimmy talk some of the new fall TV shows like Elementary and Park Avenue 666 and wax on way too long about the Doctor Who midseason finale. News includes: Grant Morrison reveales Multiversity, Patrick Stewart may be back in X-Men, FOX signs Mark Millar, Asians in comics exhibit in NYC, LUST from Ben Templesmith, Steve Niles and menton3, and Halloween Comic Fest 2012 coming on Halloween. As always, listener feedback, Top 3 and more! Leave your iTunes comments! 5 stars and nothing but love! New York Comic Con is coming up next week from October 11th-14th! 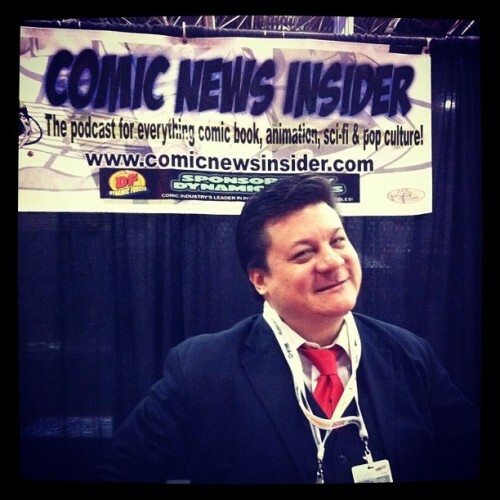 Comic News Insider will have their booth again in the Podcast Arena! Come by and visit #3350 for signings, interviews and our annual fundraising raffle where you can win great swag! Signed comics, toys and more! The schedule of events at the CNI table will go up next week! Producer Joe will be there as well taking donations for The Project Solution and giving away messenger bags with original Paul Pope art (also signed/numbered) as a thank you gift for donation $30 cash or $32 credit. We'll also have some official CNI photographers roaming around taking pictures so look for a massive photo album coming the following week. SO MUCH GOING ON!